Railway Management System Market incorporates various tools and services that enable better management of the rail industry. It includes various activities, such as traffic planning, operation management, power supply & infrastructure management, maintenance & support, station control & communication network, rail-facility information management, and others. Furthermore, the major tools used in the global railway management industry include rail traffic management system, rail asset management system, rail operation management system, rail control system, and rail maintenance management system. Railway management system offers better operation & control, asset management, energy management, traffic planning, staff & passenger information management, data analytics, and others. Moreover, advanced train management systems use advanced digital communication and on-train processing to keep track of speed and location of trains. Furthermore, railway management system offers disaster management, which is proven to be vital for the protection of asset and human lives. 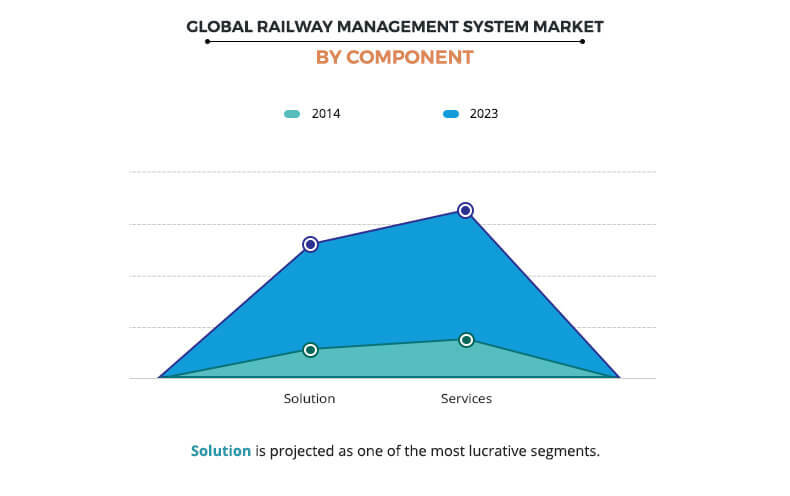 The global railway management system market is segmented based component and geography. Based on component, it is bifurcated into solution and services. On the basis of solution, it is categorized into rail traffic management system, rail asset management system, rail operation management system, rail control system, and rail maintenance management system. Geographically, it is analyzed across North America, Europe, Asia-Pacific, and LAMEA. The global railway management system market was valued at $29,434 million in 2016, and is expected to reach at $82,973 million by 2023, growing at a CAGR of 16.6% from 2017 to 2023. The major factors driving the market growth are high adoption of advanced technologies, traffic management, asset management, data analytics, control settings, and improved monitoring systems. The global railway traffic management system market is expected to witness significant growth during the forecast period, owing to significant surge in passengers and freight traffic across the globe. 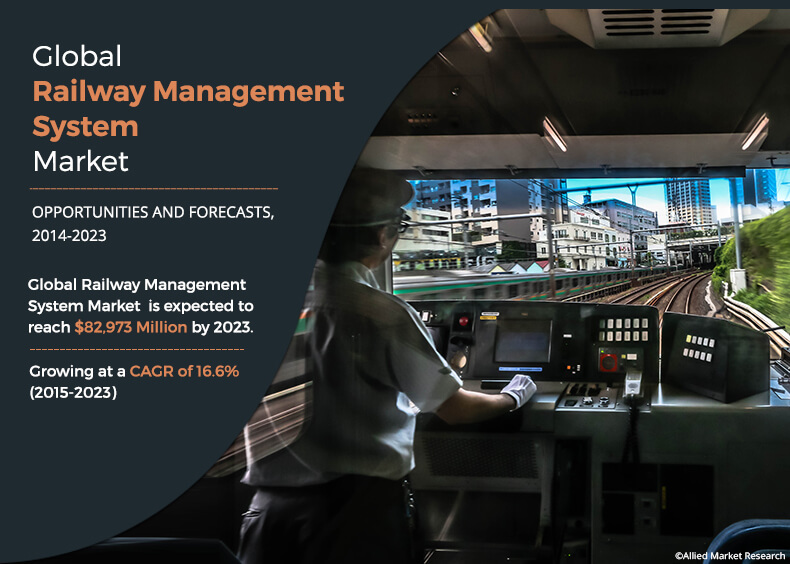 The European railway management system market generated the highest revenue in the global market in 2016, owing to adequate technology infrastructure, high adoption of Internet of Things (IoT), and growth in demand for railway management system tools. The LAMEA railway management system market is expected to grow at the highest CAGR, owing to rise in demand for the technological upgrade in railway infrastructure from Africa and South America. The key players operating in the global railway management system industry include Alstom SA, Cisco Systems, Inc., General Electric, ABB Limited, IBM Corporation, Hitachi Limited, Huawei Technologies Co. Ltd., Indra Sistemas SA, Siemens AG, and Alcatel-Lucent. These players have expanded their market presence by adopting various business strategies such as acquisition, geographical expansion, product development, strategic alliance, and collaboration. 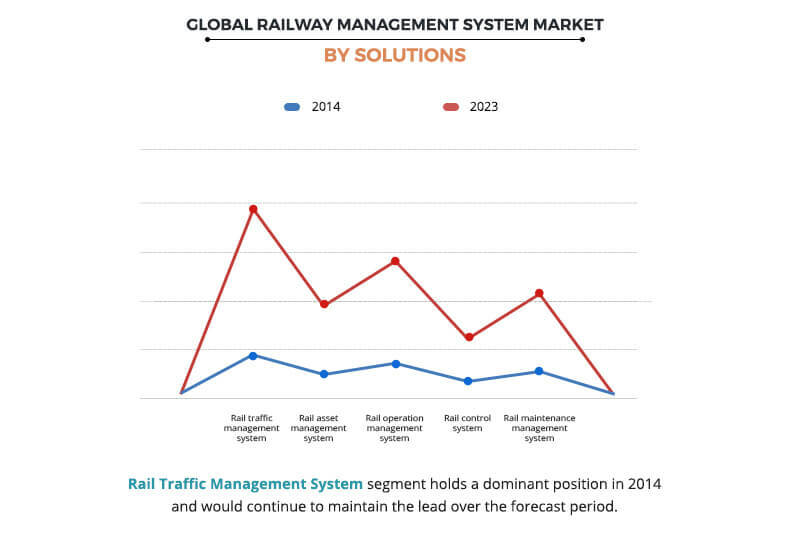 The following graph signifies the geographical growth potential of the global railway management system market. It is observed that the market has strong growth potential in LAMEA, while European market accounted for the highest share. As per the report published by International Union of Railways in 2014, the global passenger-kilometers in 2013 were 2,865.3 billion, which increased by 7.2% in 2014. This has urged government and private entities to provide novel technologies in the market to acquire maximum control over passenger traffic and freight. Supportive rules and regulations from the governing authorities have fueled the growth of the global railway management system market over the years. European Rail Traffic Management System (ERTMS) is the standard system for interoperation and management of signaling for railways in Europe. Furthermore, most of the countries, such as Japan, Australia, India, and others, have established safety regulations specifically for railway management. Railway management system is a major rising trend in business intelligence and analytics as the technology is highly appreciated and used globally. 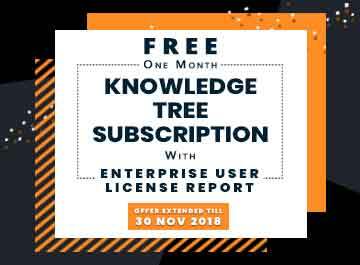 However, high costs associated with the implementation of this system in the enterprise hampers the growth of the global market. The global railway management system market by solution comprises various tools and systems offered by various players in the market. For instance, general electric offers RailConnect 360 of which asset software for rail provides novel features such as connect & monitor railroad assets, maximize train performance, and improved efficiency. The other solutions include secure station service platform, control & maintenance management, data analytics, operations management, and others. In-depth analysis of the global railway management system industry and dynamics is provided to understand the market scenario. Quantitative analysis of the current trends and future estimations from 2017 to 2023 is provided to assist the strategists and stakeholders to capitalize on prevailing opportunities. Porters five forces analysis examines the competitive structure of the railway management system market and provides a clear understanding of the factors that influence the market entry and expansion. A detailed analysis of the geographical segments enables identification of profitable segments for market players in the global railway management system industry. Detailed analyses of the key players operating in the global railway management system industry and their business strategies are anticipated to assist the stakeholders to take informed business decisions. 6.7. HUAWEI TECHNOLOGIES CO. LTD.
TABLE 18. COMPANY SNAPSHOT: CISCO SYSTEMS, INC.
TABLE 21. COMPANY SNAPSHOT: HUAWEI TECHNOLOGIES CO. LTD. The global railway management systems market is expected to grow at a significant rate of 16.6% from 2017 to 2023. The market is driven by high demand for regional and international travel, technological advancements in railway management, supportive regulations from the governing authorities, and rapid urbanization in the developing and the underdeveloped countries. Growth in need for highly efficient rail infrastructure has led to the development of high-quality solutions embedded with the advanced technology in the railway management systems. The railway traffic management, control management, and asset management are the key revenue generating segments for the rail industry across the globe. Furthermore, increased ICT expenditure on infrastructure development has improved the operation, control, and maintenance management for the railway networks. The process automation in railway operations has increased the demand for railway management system over the years. Furthermore, high adoption of advanced technologies, traffic management, asset management, data analytics, control settings, and improved monitoring systems have fueled the growth of the global railway management systems market. Moreover, load management systems, track management systems, asset management system, train control and management, railway energy management system, planning tools, data analytics, and others facilitate efficient railway management. The global railway management systems market is expected to reach $82,973 million by 2023. The railway traffic management systems market is expected to witness significant growth, owing to increase in demand for advanced transportation infrastructure and high demand for cloud-based services. The services segment was the highest contributor to the global railway management systems market, in terms of revenue, while the solution segment is anticipated to witness the highest growth rate during the forecast period. Several organizations have focused on launching novel solutions in the market to increase their market share. Geographically, the European market accounted for the highest share of revenue in 2016, followed by Asia-Pacific. 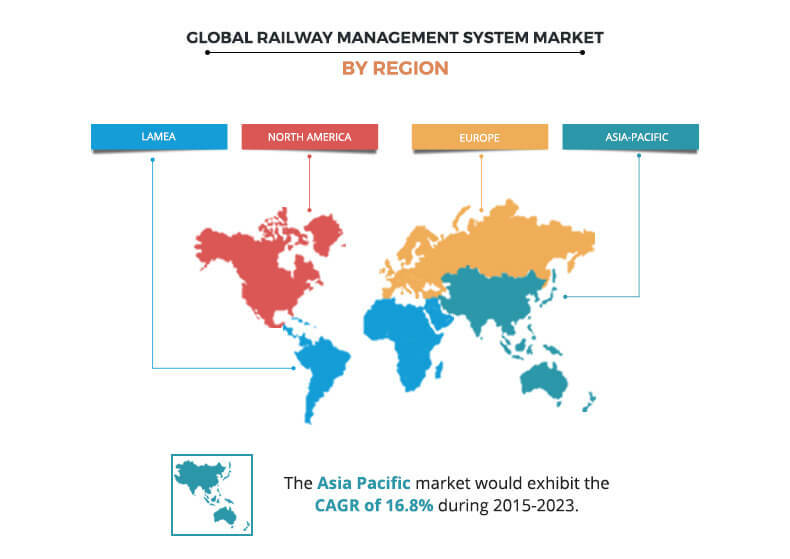 The LAMEA railway management systems market is anticipated to grow at the highest growth rate during the forecast period. The key market players in the global railway management systems industry have adopted various strategies, such as product launches, partnerships, business expansions, promotional activities, and strategic alliances, to create awareness about the technology and increase their adoption across various verticals.